Grace Reinhart Sachs is living the only life she ever wanted for herself, devoted to her husband, a pediatric oncologist at a major cancer hospital, their young son Henry, and the patients she sees in her therapy practice. 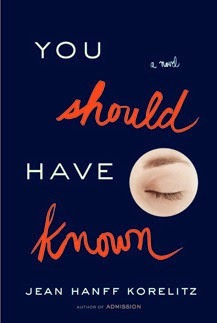 Grace is also the author of You Should Have Known, a book in which she castigates women for not valuing their intuition and calls upon them to examine their first impressions of men for signs of serious trouble later on. But weeks before the book is published, a chasm opens in her own life: a violent death, a missing husband, and, in the place of a man Grace thought she knew, only a chain of terrible revelations. Left behind in the wake of a spreading and very public disast and horrified by the ways in which she has failed to heed her own advice, Grace must dismantle one life and create another for her child and herself. Wow, it's been AGES since I finished a book! I mean, "ages" in mine & Amber's time, which really shouldn't count because we're kind of obsessed with books. ;) Anyway - I picked this one up because I had received it as a Goodreads First Read back in April, and I'd been meaning and meaning to read it. The impetus that finally did the trick? We found out that the author would be one of the panelists at the Hachette Book Brunch we attended in New York City a few weekends ago. Because of this (and because I erroneously received my complimentary keynote author's book too late to get started on it), I decided to see how much I could get through You Should Have Known before the event. The verdict? About half, which isn't too shabby considering it was a 400+ page book! It didn't take long to get really into the story, though. (Which I am sure helped me fly through it.) I had gotten a very different impression from the book blurb when I entered to win a copy earlier this year, and was entirely blown away by the intensely psychological situation this book explored. I had known the premise was that there was a woman (Grace) who had written an advice book on marriage, just before her own (seemingly perfect) marriage fell apart. I thought it was going to be a book about how a smug know-it-all got her comeuppance (or at least learned about hubris and what it means to be humble). But it was SO much more than that! Because it is the current "it book" to reference, think of the premise I just described, but with a Gone Girl twist: an unexpected and unexplainable mystery is stirred up maybe one-fifth of the way into the book. Don't let yourself get turned off by Grace's seeming materialistic ways, though - the Birkin bag section which made her sound so petty actually comes around full circle in the end. And I think it was a good way of showing that while she was surrounded by people who could afford $10,000 handbags (multiples of them!) she didn't want that kind of excess for herself. She was content to have a small home and a happy family. Finding out she didn't ultimately have the either, and the repercussions of that discovery, is really what the author was trying to convey. And I think she did a great job of writing one woman's reaction to that.